This week saw 15 new Crystal Red and Golden Bee shrimp from Mindy arrive and be added to the 10 Gallon tank. Some of the blue shrimp will be moving out in September. Some moving to the 16 Gallon tank when I feel it is ready, some to my cousin Daniel's (Mr MacPherson to his students I assume) kindergarten class. Some of the crystals will move to a tank at Anna's office. 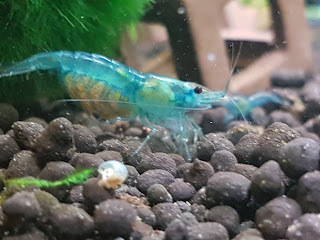 Right now everyone is getting along great, the new shrimp have coloured up a bit (their colours were less vibrant after shipping due to stress, but the reds are getting redder and maybe it's just me, or a trick of the light but I think their whites are getting whiter too. It's been a little while since I posted anything here, so it's time for an update. Momma's 3rd batch of baby shrimp are about to be born any time now. 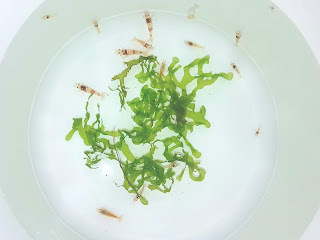 There are some young female shrimp in the tank that are reaching maturity, one looks like she could be a mommy shrimp some day soon. While other Blue Velvets will become mothers, there will only ever be one "Momma". The 16 gallon tank is on hold for now as I'm working on a 3D background (fake rock cliff) to give the shimp multiple levels and some caves and nooks to hide out in. It's made of scrap styrofoam covered in cement, so the cement will take a month or so to properly cure before it and the shrimp can safely share tank space. 3 of my Blue Velvets from Momma's first brood have found a new home in the guppy tank where Anna works. Reportedly they are doing fine and the tank is looking a lot cleaner since they moved in. Shrimp are awesome roommates.